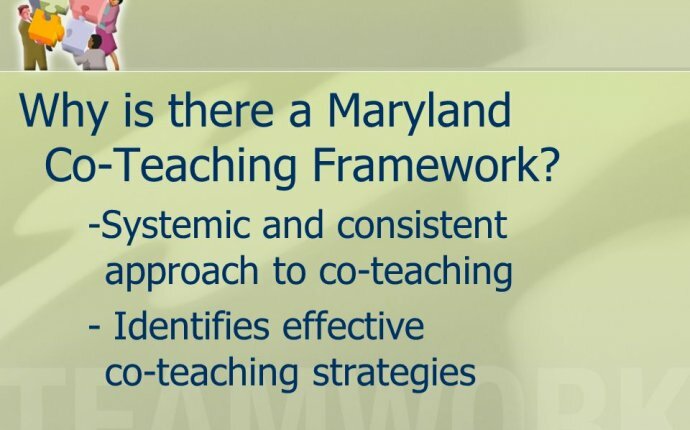 How are the Co-Teaching Strategies similar? Two or more co-teachers in the classroom. Capitalizes on specific strengths & expertise of co-teachers. Provides greater teacher/student ratio and brings additional 1-1 support for students in the classroom. All approaches have benefits and cautions associated with their use. Students are heterogeneously grouped by mixed abilities and interests. Requires trust, communication, planning time, and coordination of effort. How are the Co-Teaching Strategies different? One co- teacher is in the lead role; others provide support. Who is in lead and who provides support may change during the lesson. The co-teachers share responsibility for teaching the whole class. One takes a lead content role and the other facilitates access to the curriculum. One co- teacher teaches content; the other clarifies, paraphrases, simplifies, or records content. One co-teacher may pre-teach specific study or social skills and monitors students’ use of them; the other co- teacher teaches the academic content. Both co- teachers are equally responsible for planning, instruction of content, assessment, and grade assignment. Requires the greatest amount of planning time, trust, communication, and coordination of effort. What are potential problems with co-teaching? Beware of the “Velcro effect, ” where a supportive co-teacher hovering over one or selected students, stigmatizing both students and the co-teacher. Beware of making the supportive co-teacher the “discipline police, ” materials copier, or in-class paper grader rather than an instructor. Beware of resentment if the skills of the supportive co-teacher (e.g., special educator) are not being used or the lead (e.g., content teacher) co-teacher feels an unequal burden of responsibility. Beware of staying in the supportive role, due to lack of planning time. Beware of creating a special class within the class and lowering student achievement by homogeneously grouping lower performing students together (Marzano, Pickering, & Pollack, 2001, p. 84). Beware that noise level can become uncomfortably high when numerous activities are occurring in the same room. Beware failing to adequately prepare other co-teachers to ensure they deliver instruction as intended, since you cannot monitor each other while you all are simultaneously co-teaching. Beware of not monitoring the students who need it. Beware of too much teacher talk, repetition, and lack of student-student interaction. Beware of “typecasting” the co-teacher delivering content as the “expert” or “real” teacher.